Kimanuka Nkumbuyinka is just happy to have a bathroom. But not in the way you’d think. 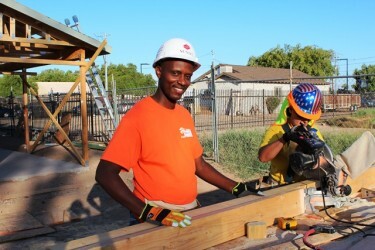 Nkumbuyinka, a Grand Canyon University maintenance worker who goes by his middle name, Boscoe, recently was selected for a sponsorship to have a five-bedroom, three-bathroom house built for him and his family through the Habitat for Humanity neighborhood revitalization initiative. GCU has partnered with Habitat to renovate homes in its local neighborhood through the nonprofit’s Canyon Corridor Project. GCU employee Kimanuka Nkumbuyinka was gifted a home by Habitat for Humanity, the University’s partner in the Canyon Corridor Project to renovate homes in the local neighborhood. Nkumbuyinka, a Congo native who spent 10 years as a refugee in Rwanda, lives in a cramped three-bedroom, two-bathroom apartment near campus with his wife and seven children, ages 2 to 19. He applied for sponsorship after his friend, another Congo native who had his house built through Habitat, suggested he attempt to better his current living conditions. Nearly 30 volunteers, including Nkumbuyinka’s wife, two friends and 10 GCU students, were at the site of the family’s future residence at sunrise Saturday to hammer the roof and exterior walls to the 1,800-square-foot house. Construction began in early October and will be completed in January. Habitat, through its sponsor company Whirlpool, will donate a refrigerator and stove top oven to the family and offer discounts on other appliances. Habitat will complete every facet of the building process, from laying the foundation and installing electric and plumbing to painting and landscaping. Volunteers will work every Saturday and some weekdays to finish the project. Most Saturdays, Habitat volunteers are building or renovating nearly 30 homes across Arizona. Nearly 30 volunteers, including 10 GCU students, nailed on wooden walls and roof panels starting at sunrise Saturday morning. On Oct. 22, GCU announced a partnership with Habitat, which includes a four-phase plan to build and renovate an entire community of local residences with the help of GCU student and staff volunteers. Saturday’s build served as the second of four planned training events for students who will serve as team leaders when phase one – an 18-month initiative – launches in January. To read more on the partnership, click here. 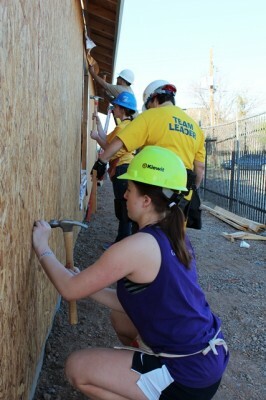 GCU freshman Sofia Montanez volunteered for Habitat for the first time on Saturday with two friends. Even with Halloween the night before, Montanez made sure she and her friends were ready when the Habitat van arrived on campus at 6:30 a.m.
Todd Buckner, Habitat’s assistant director for the neighborhood revitalization initiative, said he was pleased with the turnout and hard work of the students. He expects nearly 30 GCU team leaders and hundreds of volunteers when phase one officially begins in January. Although Buckner has helped build or renovate more than 500 homes, he said the smiles of new homeowners never get old. “It’s very heartwarming to help people, and you can tell Boscoe is very happy that we are here building this house for him,” Buckner said. “The coolest thing for me is everybody we help always seems to catch the ‘Habitat bug.’ After we come out and help them, they want to continue to spread the joy they received to others. As part of his agreement with Habitat, Nkumbuyinka must volunteer 400 hours, 200 of which must be used on his own home. From the sound of it, he already has been bitten. I am once again humbled by the experiences that I have had personally with GCU since starting here on June 2nd, 2014. As I read through this article my appreciation and gratitude to GCU grows more and more because of the things that I see GCU doing to not only help those of us as employees that may be in dire need of assistance but also the community and the people of Arizona. I am truly blessed and extremely thankful to God that GCU gave me the opportunity to be a part of an organization that genuinely cares and literally “walks the talk”. Thank you to everyone that makes it possible for us to have such a great company to work for and all of the amazing things that the company does to make sure that we continue to thrive in an industry that is constantly changing and forever being scrutinized by the public, private, and government sectors. Thank you GCU and thank you God for blessing me and the people that we help on a daily, weekly, monthly, and yearly basis. I am so proud to be a part of GCU – Go Lopes!!! !